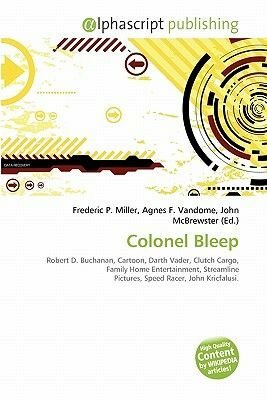 High Quality Content by WIKIPEDIA articles Colonel Bleep was the first color cartoon ever made for television. It was created by Robert D. Buchanan, and was filmed by Soundac of Miami. The show was originally syndicated in 1957 as a segment on Uncle Bill's TV Club. 104 five-minute episodes were produced. Of these episodes, slightly fewer than half are known to survive today.The show took place on the fictitious Zero Zero Island, where the Equator meets the Greenwich Meridian. There, Colonel Bleep, an extraterrestrial lifeform from the planet Futura, protected Earth with the help of his deputies, Squeek (a mute cowboy puppet boy) and Scratch (a caveman of great physical strength who was awakened from a sleep of several thousand years by an atomic explosion). Colonel Bleep, like all of his fellow Futurans, could manipulate futomic energy in a variety of ways; for instance, to propel himself through space (inexplicably, on a unicycle), or as an offensive weapon. The amount of futomic energy Colonel Bleep could absorb at any given time was finite, and in several episodes he runs out of energy and becomes vulnerable.